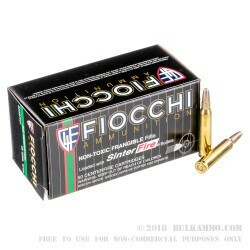 Fiocchi Ammunition is a well-respected ammunition producer based in Italy with a huge footprint of manufacturing operations in the United States as well. 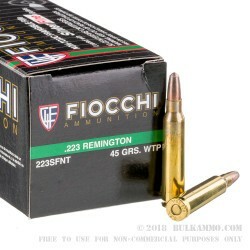 Fiocchi Ammunition supplies many NATO militaries with ammunition, including the US Military. Fiocchi is also trusteed by law enforcement and shooters worldwide. This 45 grain frangible .223 ammunition is ideal for shooters using indoor ranges, or shooting in close quarters. It is also ideal for home defense as the ammunition quickly fragments into almost a dust like substance upon entry, avoiding over-penetration and minimizing the risk of collateral damage. These cartridges are lead free. In terms of ballistics, look for a muzzle velocity of about 3175 feet per second. 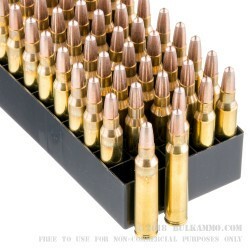 These 223 Remington rounds are boxer primed and brass cased. 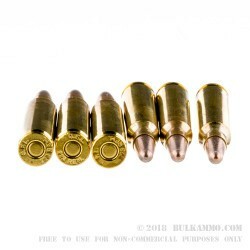 Those brass cases help ensure you can collect your spent brass and reload them, if you like.